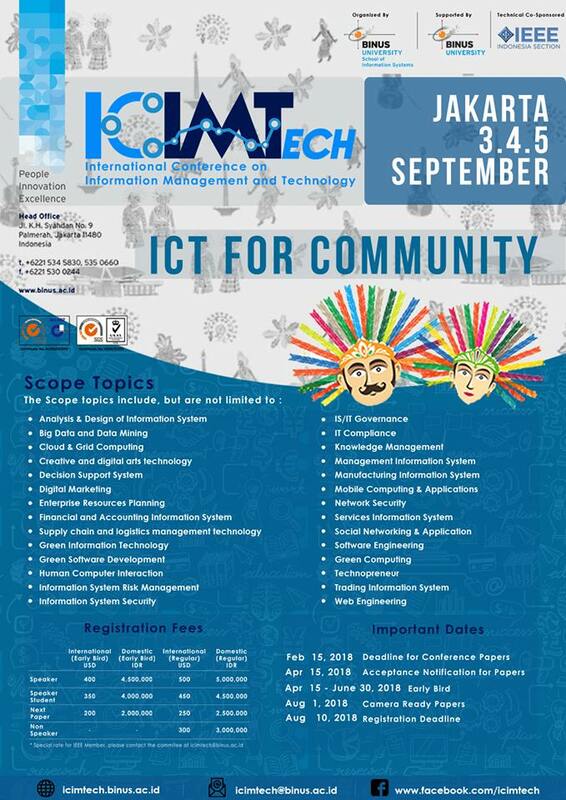 2018 International Conference on Information Management and Technology (ICIMTech 2018) is going to be held from 3 - 5 September 2018 in Jakarta , Indonesia. The conference aims to bring together researchers and experts in information systems to share their ideas, experiences and insights. We welcome researchers and practitioners from academia, industries, research institutions, R&D enterprise services and governmental organisations to exchange innovative contributions around the conference topics. ICIMTech 2018 would focus on the the issues and challenges of creating the future through information systems area; delivered through the Keynotes Speakers and Distinguished Lecturers.